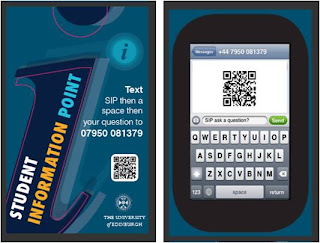 In addition to the face to face enquiry service that we offer at the Student Information Points we are developing a number of other channels of communication and delivery. We don't offer a telephone service at present but we do offer an email service. Students can email infopoint@ed.ac.uk with enquiries about anything and we will email them back as soon as possible which is usually within an hour. Basically the text service uses txttools which is now Blackboard ConnectTxt. I've used it before in my previous job and most of the system was already set up at the University of Edinburgh and it just required a few additions to make it 'two way'. It is most commonly used to text out - to send students messages about their course, assignment dates, cancelled lectures, upcoming events etc. 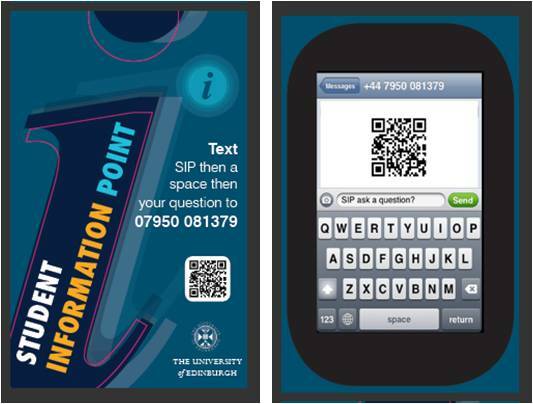 But it can be set up and used for incoming text messages which is how we are using it for the Student Information Points. The texts can be sent and received through the web interface which is simple and straightforward to use. (It is possible to use the text through a Blackboard building block although this used to be a little slow but may have improved now). We have had the system set up so that the texts come into the Outlook email inbox and are replied to as an email which then appears as a text to the enquirers phone. It's a fairly simple system that works well. The advantage of the texts coming to the Outlook email are that they can be processed by the same person and in the same way as any email enquiries. Also you don't have to be logged into the ConnectTxt web site as the text will just appear in your inbox. This also provides a way of tracking any text replies so that they can be retrieved and followed up at a later if necessary. So the text service is live and it will be interesting to see how it is used. Text messaging is to some extent an old technology as it has been in common usage for at least 10 years but I think it is one of the best forms of communication technology that there is or ever will be. It is simple, effective and used by almost everyone. I don't think it's use as part of the enquiry service will have a mass take up but I think there will be some use and also it is important to provide choice and convenience. If you have a question then the quickest and simplest way to get an answer is to text particularly if you are on the move. The use of text as an incoming service also addresses another important issue which is the overwhelming amount of information that is 'pushed' at students. Day be day the amount of communication is increased and we are at the tipping stage of information overload. This is being recognised by institutions and universities and communications policies and practices are high up on the agenda for review. 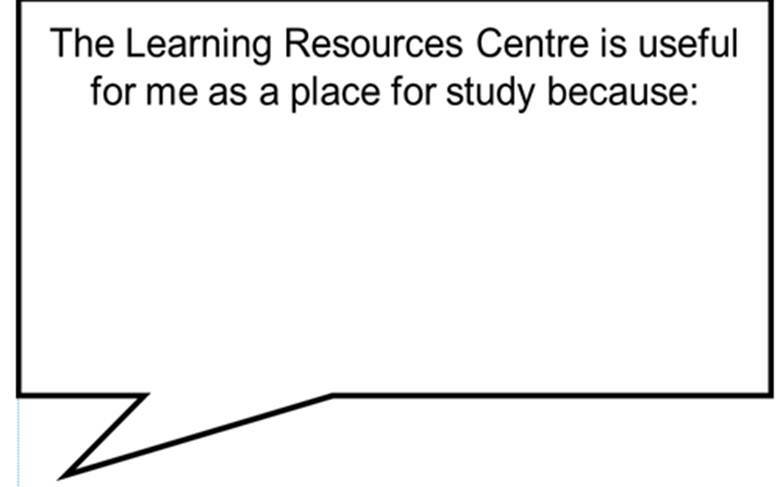 But by providing a service that students can easily access but 'pull' when required has a certain appeal. One of the exciting aspects of starting a new job is meeting new people. Over the last month I have met lots of new people and been to lots of meetings. As far as meeting new people in a work environment is concerned it can be overwhelming and I think you have to take on board the fact that you are not going to remember everyone and will have to follow it up later. One way that I have tried to do this is by making a quick note of people's names and then looking them up later. Or asking them if it would be alright to drop them an email in the following few days. Email makes it so much easier to follow people up as you can usually find them in the institutions global email address book even if you were not quite sure of their name. It also helps that it will have their department so for instance if you meet someone who you know is from Registry or Chemistry but didn't quite catch their name you can go and look up their department and job title and track them down. You have to be pro active to some extent and make the most of the fact that you are new and can ask people if they want to meet for a coffee/ chat/ update because you're interested in what they do or would appreciate their advice etc. I'm getting better at this than I would have been in the past although I've only realised this on reflection as I've done it without thinking. You have to be careful not to put your foot in it and work out whether someone is going to be happy to talk to you or going to be too busy or important but with a bit of care, it works. At least if you are new and make a faux pas you've got a good excuse being new. I have been very fortunate in that everyone at University of Edinburgh has been very kind, helpful and friendly. I have also met some very interesting people who are efficient and clever which appeals greatly. I've been to quite a few formal and informal meetings. At the start I was invited to meetings in order to talk about our part of the overall project. 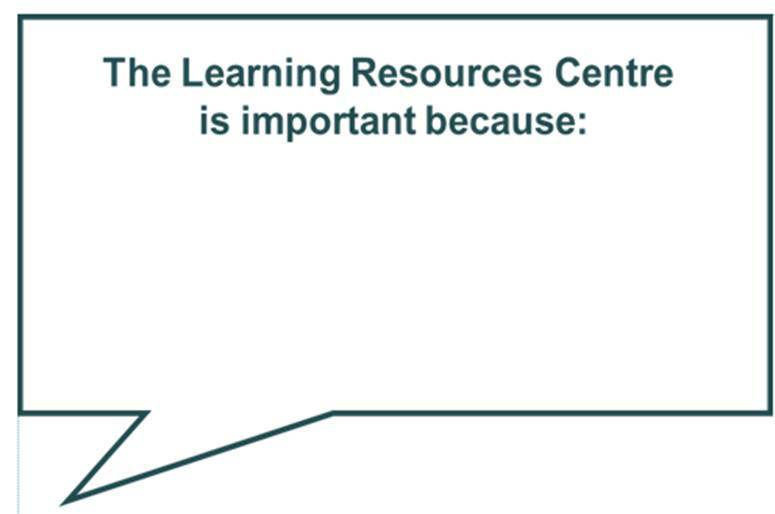 The Student Information Points are a small part of the Enhancing Student Support project. At first I talked in general terms about what we were hoping to do and how we envisaged it would work. As time has gone on it has been possible to start feeding back on our progress and give information of the current situation and further developments. The more practice you get with meetings the better and I have become more experienced especially over the last 5 years. Every institution, organisation, committee, group does it slightly differently. Sometimes it is very formal and people speak through the chair, sometimes it is a free for all. You have to work out who are the most important people either by rank or by stake in the project or group. Sometimes there are minutes, sometimes notes and sometimes it s up to you to take your own. The more experience you have then the easier it is to work out the system and pattern that is being used. I tend to prepare a set of notes in advance of what I could say if asked or if I have already been asked to contribute, I'll take a summary sheet with me. You don't necessarily have to use them but its good to have. It gives some structure and generally makes a better impression. We are now at the end of our fourth week and so far so good. The Student Information Points have been operational at the three sites every day and we have dealt with hundreds of enquiries. One of the most important aspects of the enquiry service for me from the beginning was that we needed to record the enquiries in some sort of way. I wanted to ensure that we collected the data in one form or another from the start. The two main reasons for this were that I wanted a record right from the start which would show what we were doing i.e. the activity of the service in so much as it could be measured. Secondly because I suspected that this was something that wasn't necessarily being recorded in other areas and would be of interest further down the line. Collecting and presenting data can easily become an enormous task, never ending in fact and this was something to consider. What I wanted was a quick and easy way with the basic requirements that it took less than 20 seconds to record an enquiry (preferably less than 10) and that it could be used by more than one person simultaneously. An additional requirement was that, if possible, it would be saved automatically. Therefore we decided to use a Google form. In the past I've used them for the 'user' to fill in but for the Student Information Points we are using them for the team on the desks to fill in to record an enquiry that they have been asked. To start with I created a form based on the ideas from the team. Our SIP service was due to start in Freshers Week, and it did, but because it is a new service we didn't know what questions were going to be asked. So we guessed and it turned out that we were quite close to what we needed. We used version 1 of the form for Week 0 (Fresher's week) and Week 1 and then updated the form to reflect the questions that had been asked. So we now have data from two lots of two weeks - there are not many changes between version 1 and version 2 of the form so much of it can be compared across the 4 weeks. In the future we will review and develop the way we collect the data from the enquiries. We need to consider how we need to protect the data if we start having enquiries that contain details about individual students rather than general enquiries. We need to look at how we use the University systems and how we integrate the data that we collect with other systems. I expect that we will also need to review our data collection methods when we receive feedback from presenting our information to the interested parties. But for now, it works. I'm glad we've reached the end of term - it feels like an achievement. Today I tried to get all outstanding tasks done or at least sorted for two weeks as I don't intend to check my emails while I'm off. We started the day with our department meeting. It's good to have an update and to let everyone know some of the new developments that are going to be introduced after Easter. These include changes to floor 2 including walk up bookings for computers and more roving and also a staff upskilling programme. Then I went to a strategic issues briefing for managers by the principal and senior managers. This is quite a good idea and useful for updates on funding and financial information. Other tasks were sorting out our web conferencing project, checking up on the situation regarding the transfer of data from Blackboard to SharePoint, chasing up outstanding technology equipment and lots of other bits and pieces. I had a meeting with my line manager to let him know what's happening and what we've got planned. It's good to catch up. Hopefully I've sent all the emails I need to and not left anything urgent outstanding. 1. Kindles - although we've had them for a few months now we have been loaning them to staff and students within the LRC just to see what they think. Although there has been some interest we have decided that we need to have a 'proper' pilot and promote their usage across the curriculum. We are starting from today and have four lecturers / tutors who are interested in using them with their students. 2. 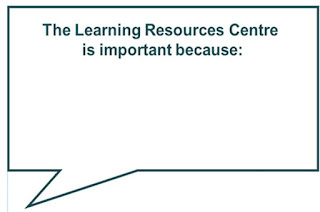 Electronic Course File to SharePoint - we are moving our electronic course file from the content collection on our VLE to our Intranet on SharePoint. Hopefully this will make it a bit easier to access for staff. 4. Inductions - it's that time of year when we have to plan what we are going to do for inductions in September. Last year we had the 3D Induction experience plus interactive feedback - this year we are going to try and combine the successes of last year into an online experience. It's still at the early planning stages so will be interesting to see what we can and can't do. I also want to try and do something using Augmented Reality - a self directed familiarisation tour - don't know how yet but I'm sure it's a possibility. 5. Journals - it has been the dreaded J word for much of this year - some of our journals don't get used much but I'm not sure why, whether it's lack of demand or lack of awareness. We are going to promote them both the paperbased and the electronic formats. 6. Mobile App - our mobile app that we launched in January has been successful. The next phase with more fuctionality including a library app is planned for release in August. It's not been a great week - in fact it's been one of those weeks which, while not being a disaster, has been disappointing. I wish it could be re-run but more positively with maybe a bit of luck. Today has been a catch up. Sorting out the online web conferencing sessions for next week. Checking on how some alterations at Easter elsewhere in the College will affect us. Organizing our Kindle pilot project which is something exciting to look forward to. It's home time but I'm gazing out of the window - the windows are a bit murky on the outside and the Cleveland hills are misty, I can't make out Roseberry Topping. 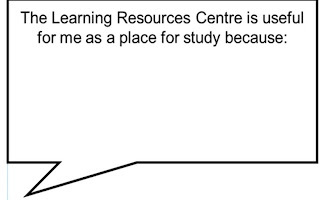 This is how it feels as far as work /education /learning resources / technology etc. is at the moment - the near future is slightly unclear although everything is carrying on, just more difficult. The long term future, like those hills, is shrouded in mist - can't make it out at all - it's there somewhere though - hopefully.